opportunity for faculty members, students and staff to gather together in the stylish ABF Student Center Theater Hall and recognize the achievements of distinguished students in their academic fields and extracurricular activities. The 21st Honors Convocation Ceremony kicked off with the“Hymn in Honor of St. St. Cyril and Methodius” performed by the AUBG Choir. President Michael Easton was the first to take the floor and welcome the students, faculty and staff present. He emphasized that AUBG has established itself as a higher education institution in Southeast Europe which attracts, nurtures, and prepares gifted young people from numerous nationalities for the challenges that await them in their future career development. AUBGers have always distinguished themselves as people with with high aspirations and looking forward to bright futures. At the end of his speech, Dr. Easton asked all the students on the President’s List to stand up and be recognized. This year there were 116 students who had a GPA between 3.80 and 4.00 after completing two semesters in AUBG. Provost Steve Sullivan then recognized all the students who were on the Dean’s list for completing the past semester with GPA between 3.80 and 4.00. SG President Timur Huseynov also congratulated his distinguished peers and thanked the faculty body for all the support they render to his fellow students during their studies, by helping them to overcome challenges and difficulties. “Students’ achievements are the best advertisement for the university,“ Huseynov said. “And we are thankful for all the knowledge we accumulate that prepares us for living in this ocean of limitless opportunities called life. AUBG has taught us how to fight and not give up on our vision, to follow our dreams and transform the world around us!”. Provost Sullivan and Dean Krise also announced and awarded students with outstanding achievements in the respective majors and minors, students who have excelled in arts and athletics, the winners in the University Council Essay Competition, peer counselors, student advisors, and resident assistants. The pinnacle of the event came when President Easton announced the recipient of the Presidential Medal. 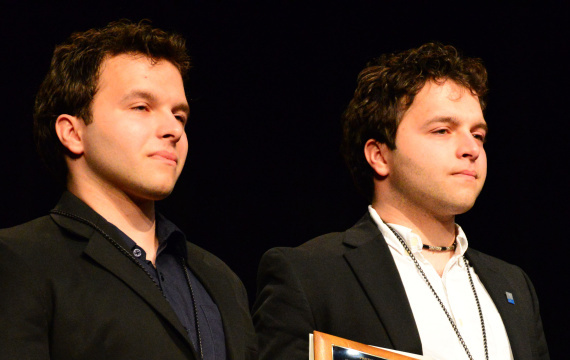 This year, for the first time in the history of AUBG, the award was given to two students of outstanding potential. 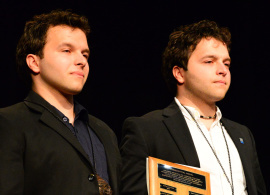 The Serbian twin brothers Ivan and Boban Markovic received the prestigious distinction for their numerous extracurricular activities, their passion for education, and their participation in community services. The twins are graduating AUBG with majors in Political Science and International Relations, and Business Administration. Both of them are active participants in the student life of the university and the list of their accomplishments includes: participation in the Board of Trustees of AUBG, student advisors, BLIMUN chairs, members of the Phi Beta Delta Honorary Society, members of the Political Science Club and the Better Community Club. Ivan is also a vice-president of the Organization of Serbian students abroad, while his brother, Boban, supports the library in their hometown with donating over 100 books.